St Petersburg was the stop that most excited me on my recent Princess Cruise through the Baltic Sea. 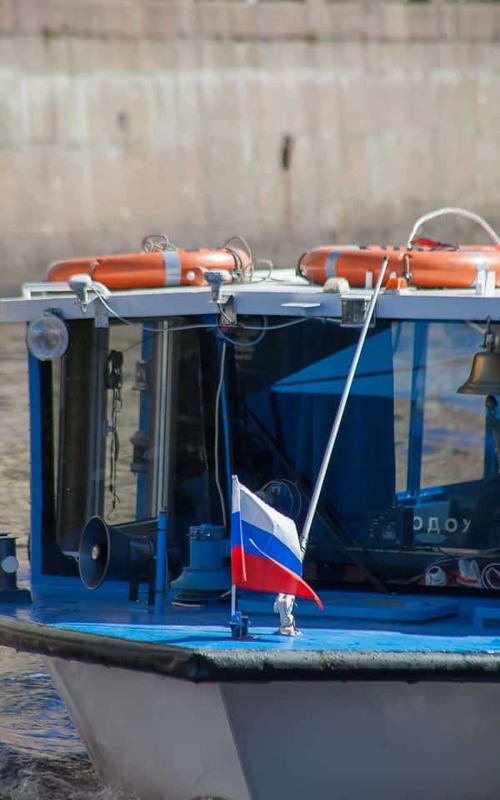 The best thing about visiting Russia on a cruise is that you don’t require a visa (which can be costly and time-consuming) if you have booked yourself on an authorised excursion before arrival. 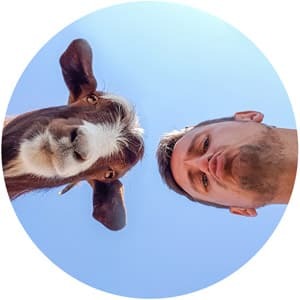 While that may sound like you are going to be herded around under a watchful eye, in reality, it merely means that you’ll be guided through some of the top sights in the city (our guide was terrific and very open to all conversation topics) as well as being given some free time to explore on your own. 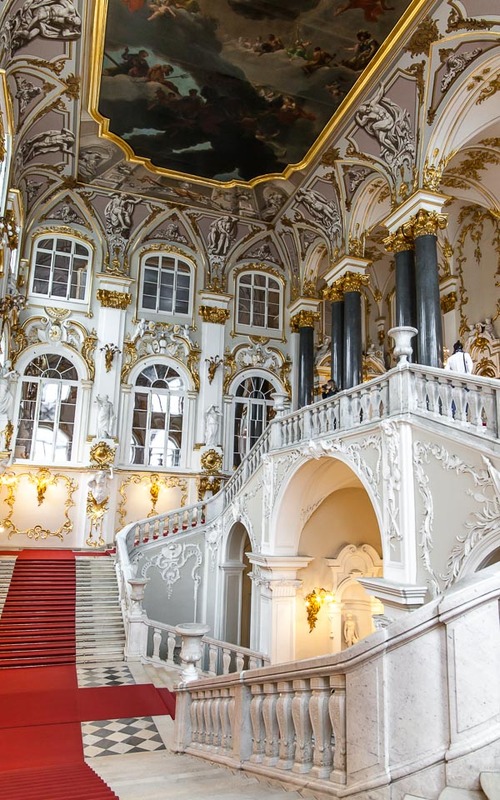 I opted for an excursion from Princess directly as they guarantee the ship will wait for you if you return late but only when booked direct and their ‘Best of St Petersburg’ small group tour with a few personalised tweaks was an ideal introduction to this captivating city. 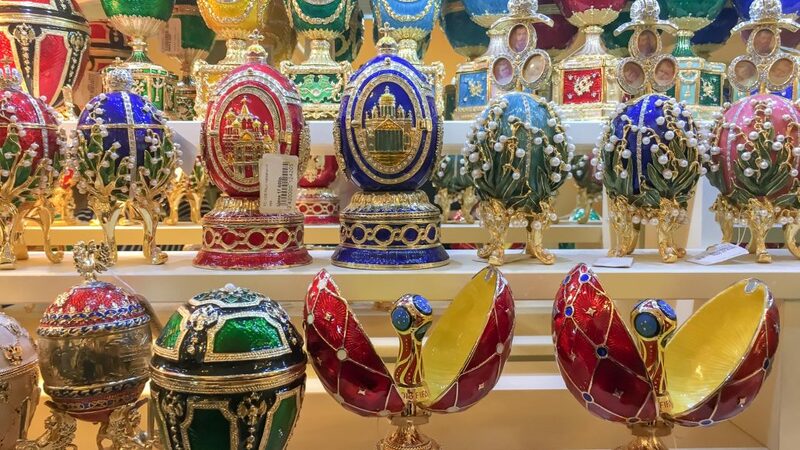 Scroll down to read everything I got up to in St Petersburg or jump to 3:30 on the video for a glimpse into the city. 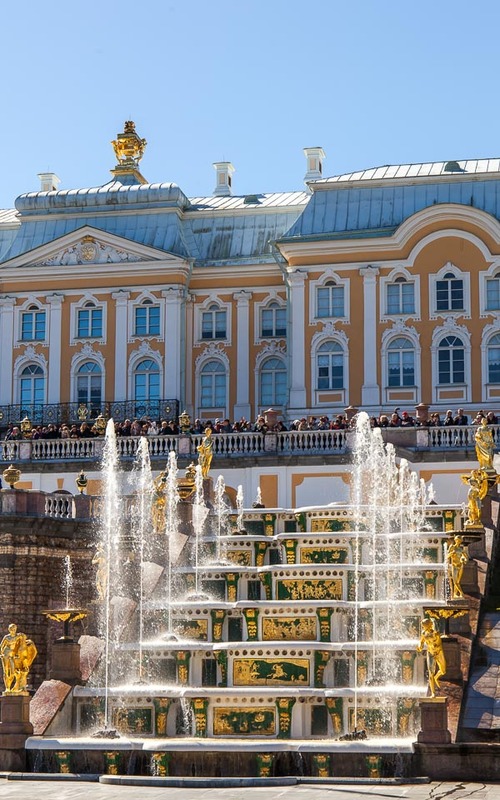 Excursions available: If you want to take advantage of no visa entry to Russia, you must book an excursion off the ship either with Princess directly or an authorised local agent. I’d highly recommend the ‘Best of’ tour specifically for small groups and adding an early entry to the Hermitage museum. This 11-day Baltic Sea cruise with Princess Cruises starts from £999pp for an interior stateroom based on twin-share*. Taking in Warnemunde Germany, Oslo Norway, Copenhagen Denmark, Stockholm Sweden, Helsinki Finland, St. Petersburg Russia and Tallinn Estonia, it offers a great chance to explore many cities in a short vacation. 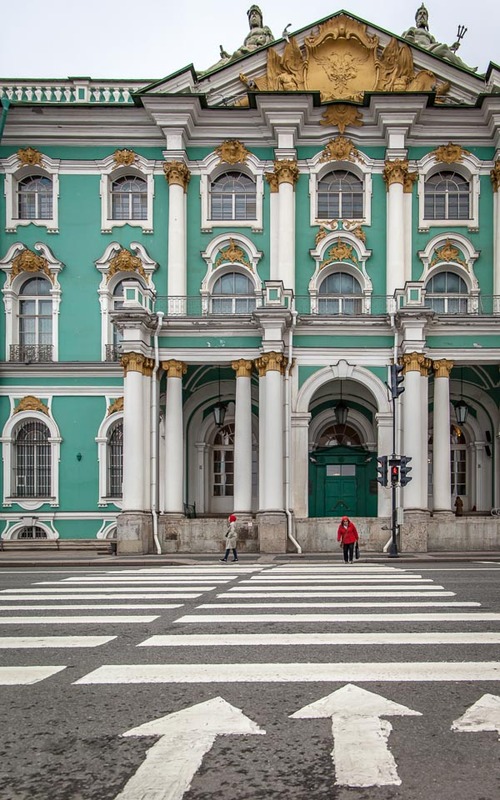 Within just a few minutes of entering the Hermitage Museum, a grand building and formerly the private museum of Catherine the Great, I declared it the best architecture I had ever seen. Being the largest museum in Russia and home to about three million pieces of art you’d think that what was adorning the walls would be the unique part, but actually, the grandeur of each room and hall is what had me truly mesmerised. 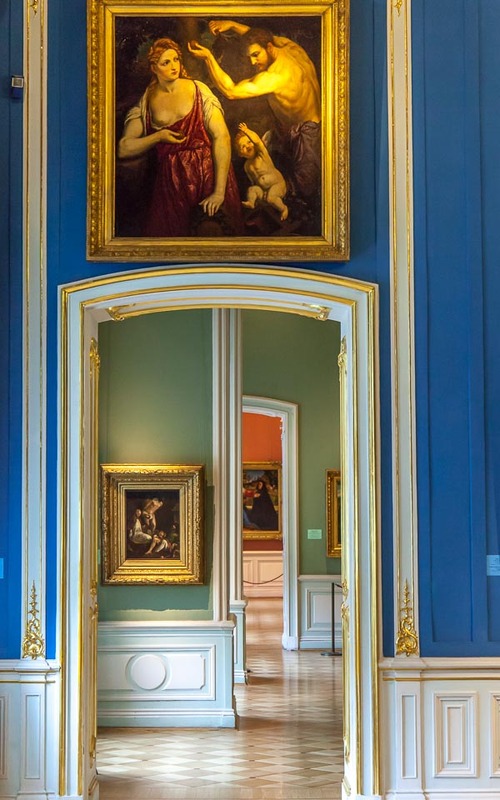 A special bonus of visiting the Hermitage with Princess Cruises is they can arrange an early-morning entrance a whole hour before public admission starts and as we saw all the crowds lining up to enter I realised what a worth investment it was to get in before everyone else. I don’t think I would have been able to appreciate the magic of the museum so well amongst all the people who visit here daily. Next up we headed to the Peter and Paul fortress which sits on one of the many canals and waterways which make up the island collective of St Petersburg. Originally built to protect the city from attacks from the Swedish, if you are around at mid-day, you can still hear the daily cannon firing during your visit. 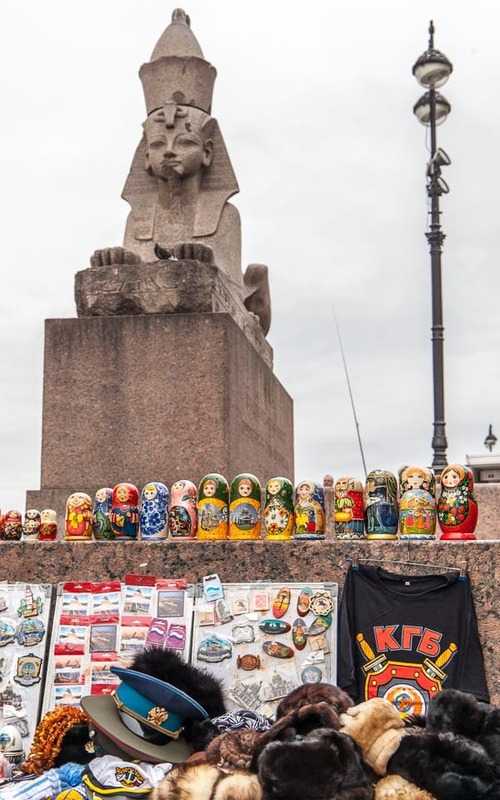 Used for the imprisonment of Political Prisoners for many years the massive fortress offers a look into the history of the country as well as the intricate art and grandeur of the city’s second tallest structure, the Peter and Paul Cathedral. 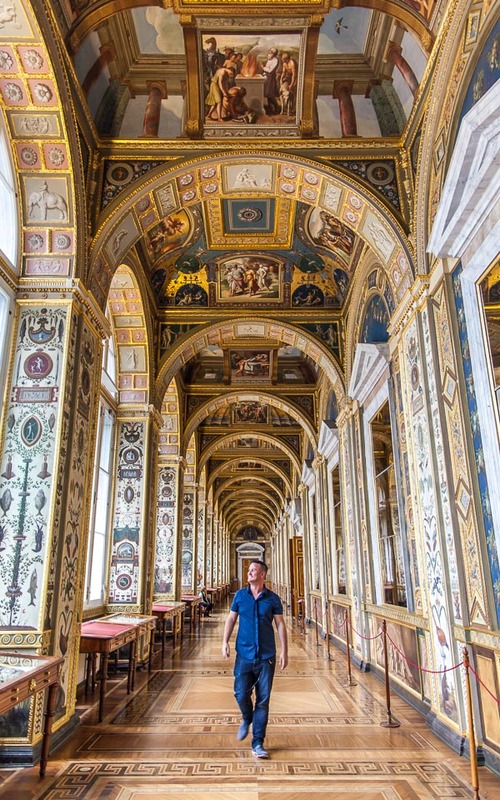 Inside is a jaw-dropping collection of paintings from the 18th-century and highly detailed golden and tiled details across the floor, walls and ceilings. The tomb of Catherine the Great also lives here which makes it one of the most visited tourist attractions in the city. One of my favourite things about the two-days we spent in St Petersburg was getting to see the day-to-day life of the city. 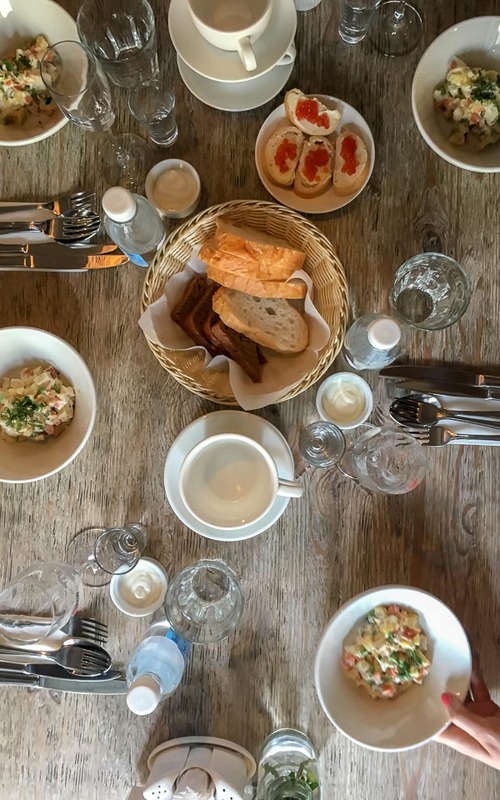 Often in the west when we read about Russia, it’s some dramatic headline so to be able to wander the busy shopping streets, dine at little restaurants next to disused tanks and spend time chatting with our fantastic guide, Zhayna, was fantastic. 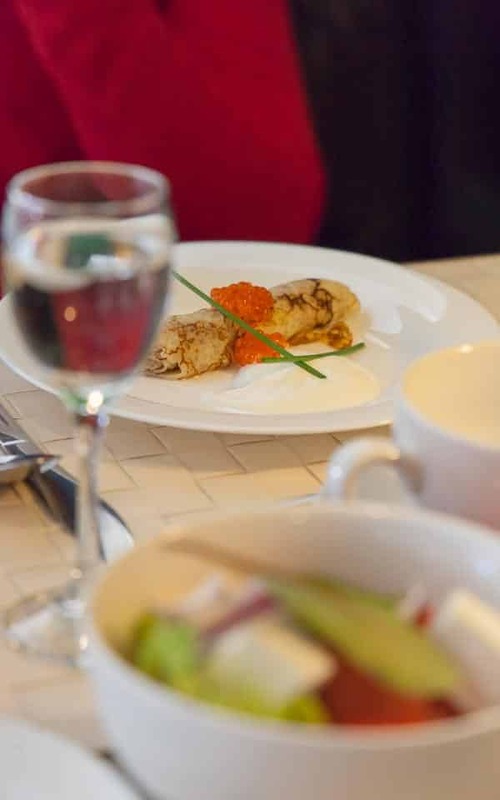 On both days we dined in restaurants which I’m sure are more targetted to tourists, although the first one on the main shopping street Nevsky Prospekt was also abuzz with locals snacking at the contemporary interiors of Biblioteka. 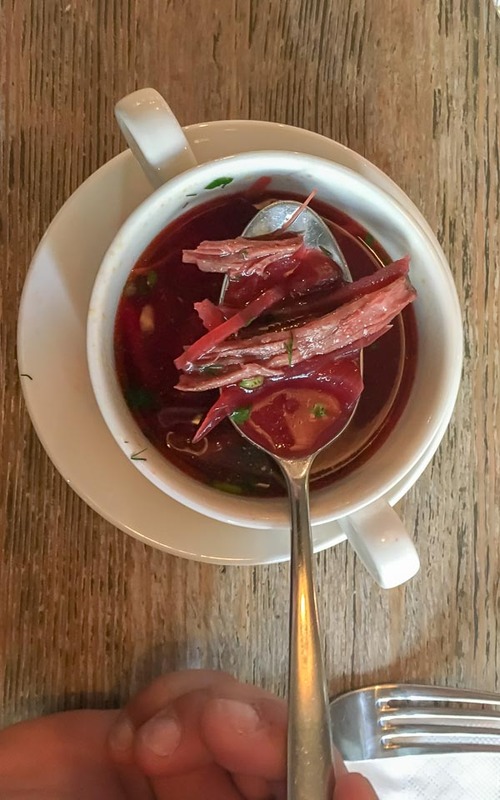 The set-course lunches included an abundance of Vodka (when in Russia and all…), Borscht, a local soup with a beetroot base and mixed potato salads and fish roe, all popular dishes in the country. If you aren’t familiar with the story of Rasputin, then it is well worth reading up on the self-proclaimed mystic before visiting the palace. Built in the early 18th century, the Palace shows what lavish lifestyle nobles of the country would have had while many others struggle. Even now, touring these grand buildings which are dotted between rather ugly Soviet buildings its quite the contrast. 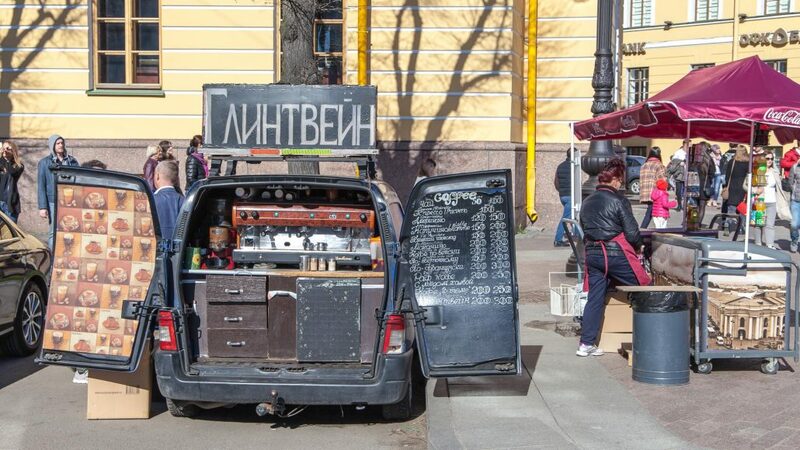 With many people in St Petersburg living in communal homes still to save on rent you can’t miss the fact there were, and are, two-sides to life in St Petersburg. It was in this Palace (and the cellar, as seen above) that Grigory Rasputin endured a dramatic assassination that took more than one attempt. 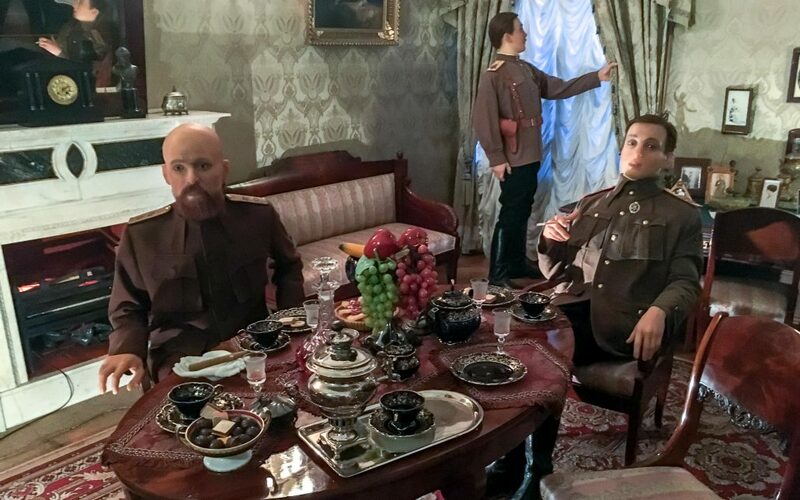 Felix Yusupov and friends were the murderers of this controversial personality, and through the tour and models throughout the cellar, you can gain a glimpse into the story and life of a man who was somewhat influential over the years before his unexpected end. 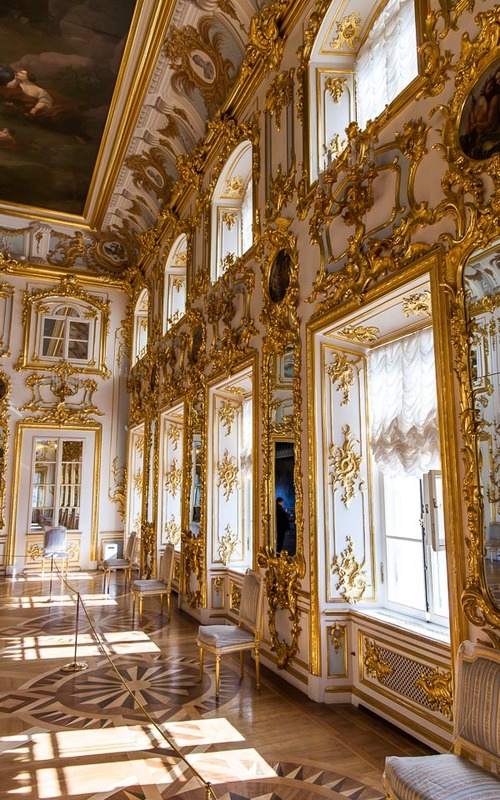 As with many of the elegant buildings and palaces throughout Russia, the Yusupov Palace is full of expensive and intricate details including a small, gold-gilded private theatre where shows would have been performed to the noble household. 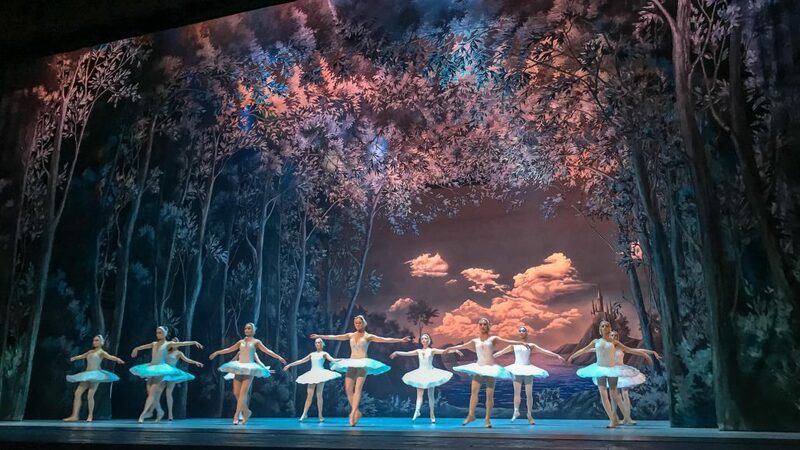 A significant bucket list tick for me as both a traveller and someone who studied performing arts was to see with my own eyes the Russian Ballet perform. Princess Cruises bulk buy some of the best seats in the house, so we were just a few rows from the stag of the Alexandrinksy theatre for the evening performance of Swan Lake. 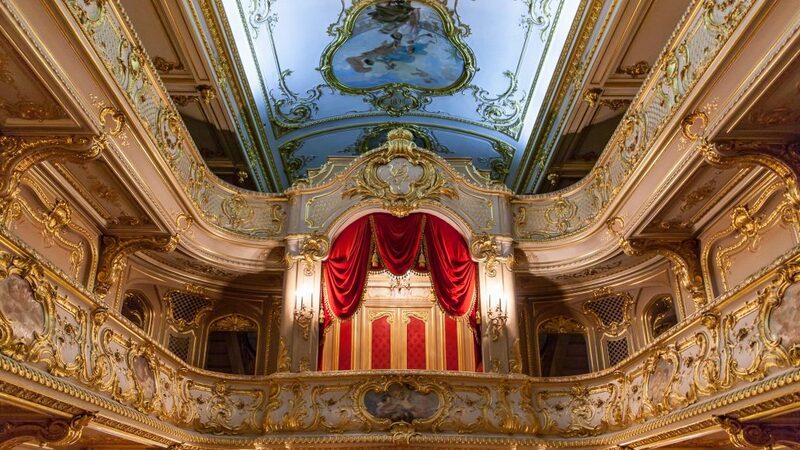 It goes without saying that the Russian ballet, partly because of how popular it was with the noble families of the city, is one of the most famous in the world and to witness the performance in the oldest professional theatre in Russia was something I will never forget. 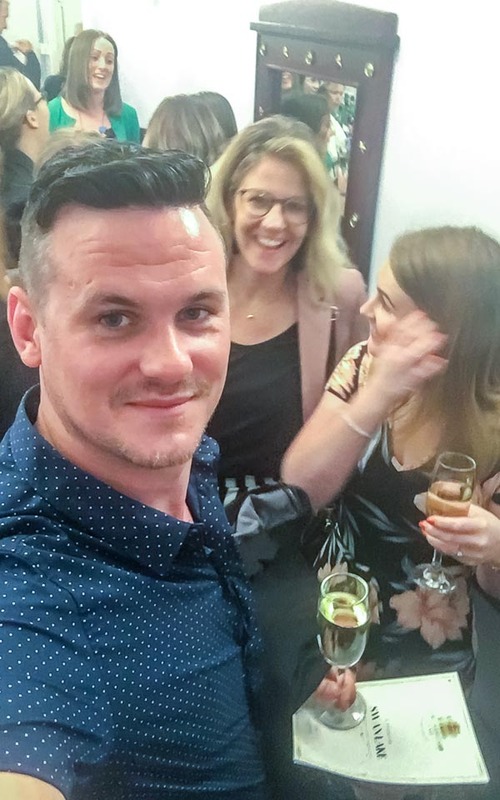 Over the interval and enjoying a glass of fizz in the bar I couldn’t wipe the grin off my face. Another bonus of venturing out of the ship after dark was seeing the city by night from our coach windows, it was beautifully lit up along all the canals. I wish I had looked into some of the night tours to see some more of it during the evening and perhaps even tried to find a late-night tour of the nightlife. 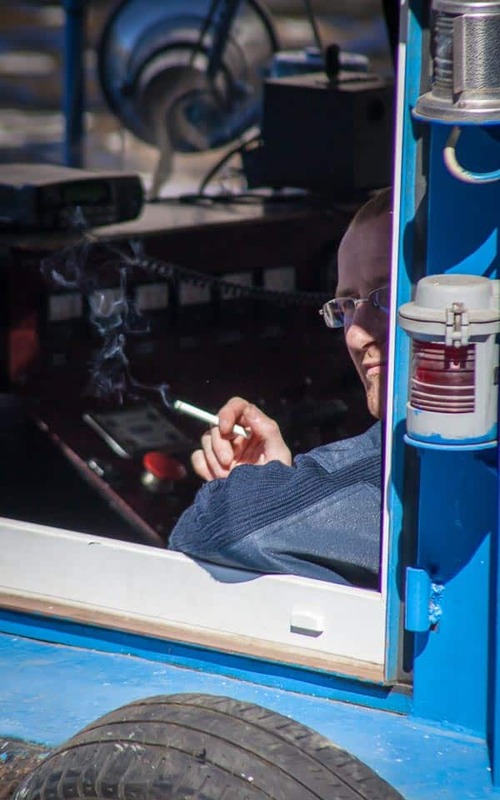 Even with the cruise you are able to come back at any time of the night as the security will still be there for clearing immigration and getting back on to the ship, the only thing to consider is that you would still need some kind of tour as the same rules apply day and night without having a visa. 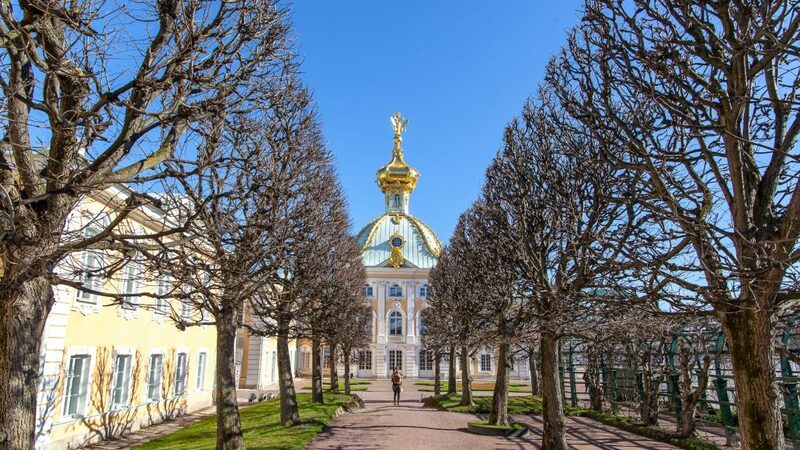 The second day of our Princess Cruises tour started from the cruise port driving out to Peterhof, home of Peter the Greats grand palace, one of the most impressive and important buildings near St Petersburg. Set in a vast park which is home to various pavilions, cascades, bronze and gold-gilded statues and around 150-fountains it’s fair to say this elaborate destination could keep you captivated for hours. The tours inside the palace are almost military in operation though, with resident guides keeping the tour groups moving and only moments in each of the many rooms which make up the interior. Once outside though you can slow down the pace to admire the statues and fountains that roll down the perfectly manicured green lawns and hills. If you visit in the morning you are also able to see the switching on of the Grand Cascade which is currently the largest fountain ensemble in the world and the switch is flipped at 11-am to great crowds and accompanying music (note the fountains are only active during the summer months). On a clear day, you can also see far across the Gulf of Finland and wave at the cruise ship parked up in the distance. 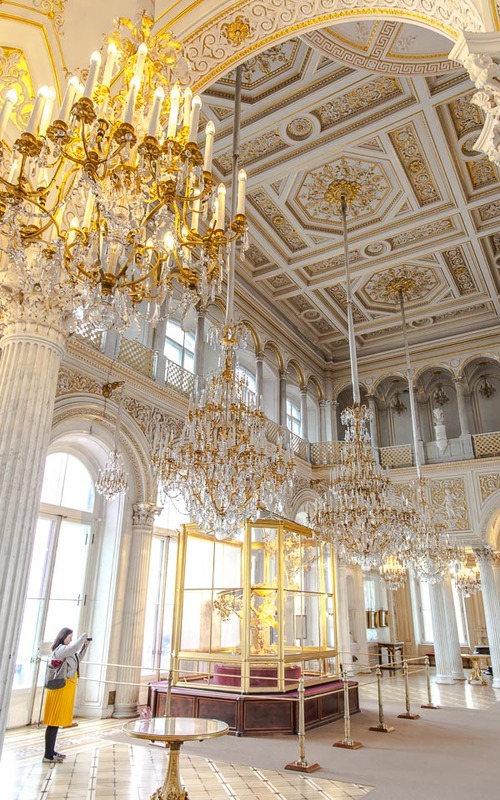 There was a lot of damage done to the Grand Palace in the second world war but a significant amount of restoration has taken place to restore the building to its baroque glory. While it is around a 1-hour drive from the city, it is something you should not miss. 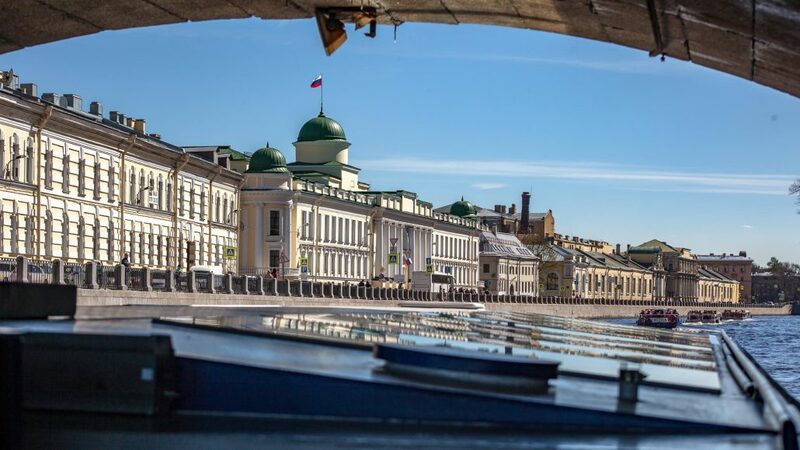 Many people don’t realise that St Petersburg as a city is made up of 42 different islands which means there are plenty of canals to explore, thus taking a canal boat cruise is an ideal way to see much of the city. The main river through the city is called the Neva and was essential for trade to pass through the city and beyond into the oceans. We sailed for just over an hour and saw many of the grand buildings that adorn the postcards of St Petersburg from an entirely different viewpoint than we had on foot or by coach. The bridges in St Petersburg that link the many islands together are also rather lovely and, interestingly different bridges close at various times throughout the night which means locals need to make sure they plan their route if staying out into the early hours. 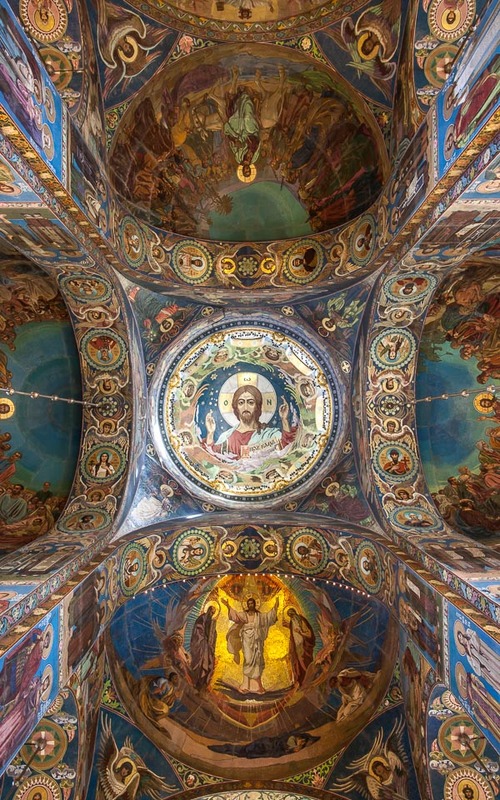 One of the most famous sights, when you think of St Petersburg, is the Spilled Blood Cathedral, a multicoloured Orthodox church constructed on the spot where Alexander II was assassinated. His son decided to build the church here in memory of his father. 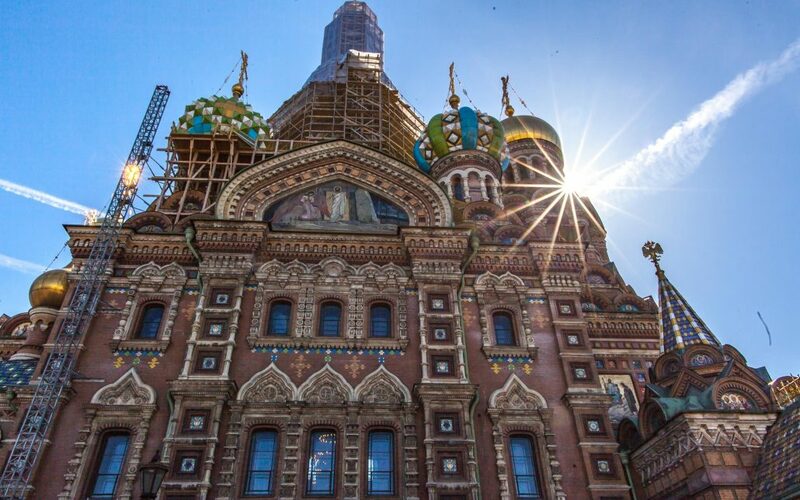 If you have seen photos of Moscow, you might also recognise the building as it was inspired by the very similar looking St Basil Cathedral which resides in Moscow’s famous Red Square. While the outside of the church is fascinating thanks to its onion-shaped roofs and fine-detail adorning the stone, inside is just on another level. 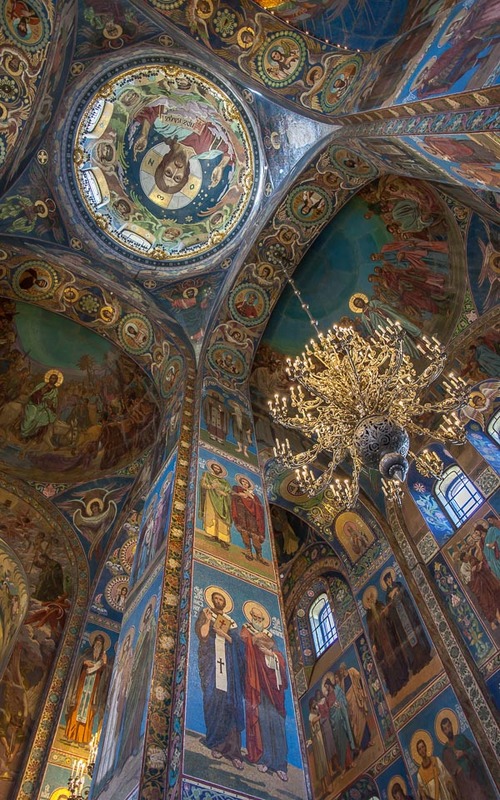 The tiles that cover the walls and ceiling of the church are said to be mosaics that cover 7500-square meters, and you can’t help but strain your neck as you try and take in every single one of them. Being from the UK I’ve visited a lot of churches and cathedrals before and this was hands down the most impressive I have ever seen, the many years that went into constructing such a breathtaking building can be understood when you look at just how much attention has gone into the intricate insides. 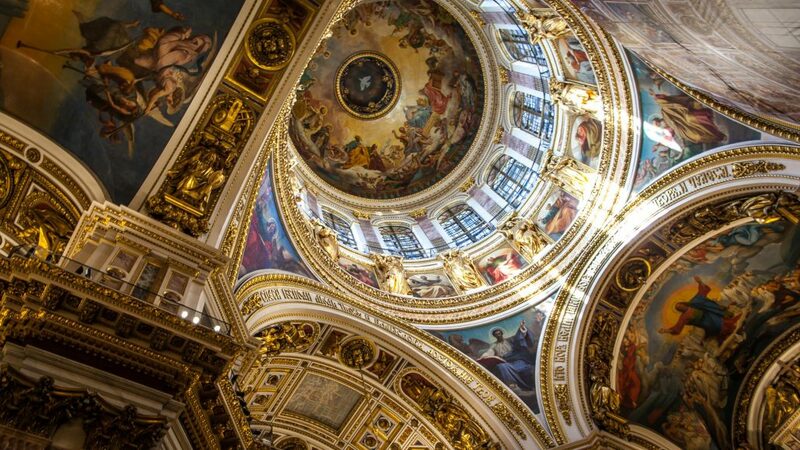 Our final stop on the ‘Best of St Petersburg’ tour was at St. Issac’s Cathedral which we had seen numerous times while visiting other parts of the city as the domed roof dominates the skyline. Again, once inside the somewhat plain looking exterior I was captivated by the 4000-square meters of the Cathedral. Look up, down and all around because this place is special. The white marble that sits on the floor, the mosaic icons that layer up the columns and the fine paint-work which lies in the nooks of the domes will leave you speechless. There are hundreds of pieces of 19th-century art decoration St Issac’s Cathedral, and it was a pretty grand ending to an intriguing two days in St Petersburg. 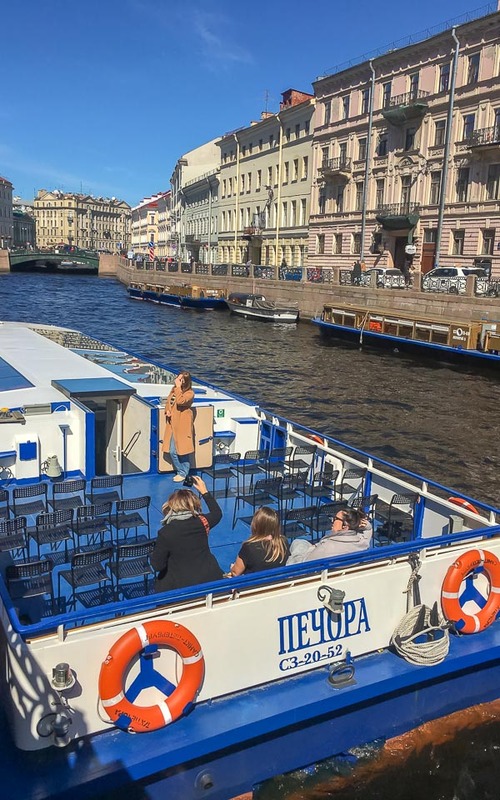 There was plenty crammed into this weekend in St Petersburg, including lots of questions to our patient guide, but as we rode back to the ship to depart onwards to Helsinki, I was so pleased to have finally visited St Petersburg, one of the most unique cities I have ever explored. 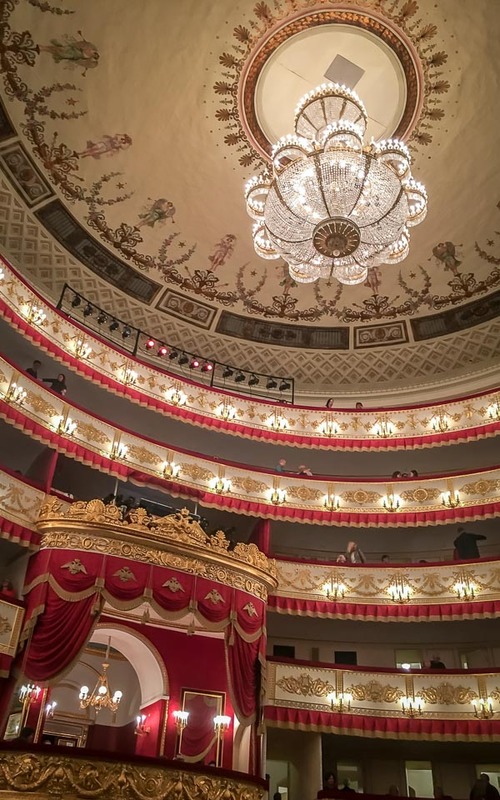 I was blown away by St Petersburg, between the galleries, architecture and performances it is such a unique city to explore for its art and history, and I felt the two tour day was an excellent introduction to a country that can seem like quite an adventurous destination for many. 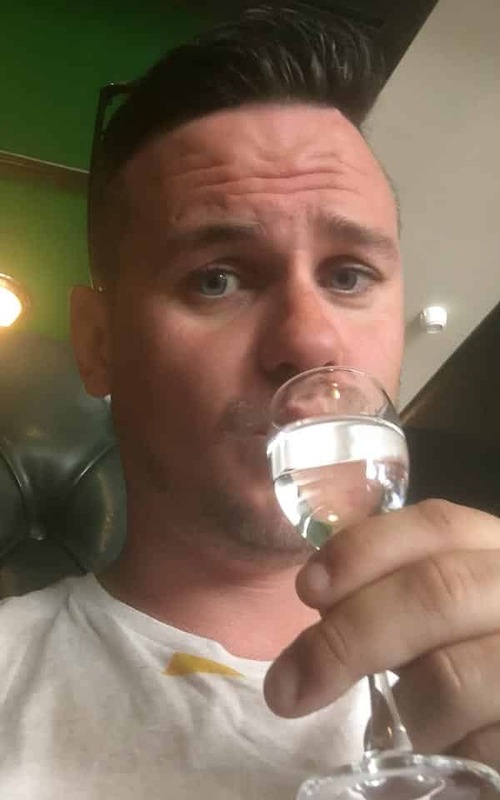 Will I be going back to Russia? For sure. 20 Cruise FAQs & Myths Debunked: Did I love it or hate it?